← Podcast Pitch: Command Center, Inc. I like companies where a highly concentrated ownership structure leaves only a small percentage of shares in the public float. In this way, sometimes even relatively large companies can be nearly uninvestable for firms of any meaningful size. Now and then this can lead to significant mis-pricing, as market participants who would ordinarily take advantage of the opportunity cannot act. A prime example of a situation like this is Schuler AG. Schuler is a German metal forming company, just one of Germany’s plethora of successful small-to-medium-sized enterprises often called Mittelstand. These companies share a number of characteristics, among them a focus on efficiency, mastery of niche products and/or processes, a partnership model of owner/employee relations, and a focus on exporting. Schuler produces the massive, complex and incredibly expensive industrial presses used in many manufacturing processes like automotive manufacturing, coin minting and many others. Recently, Schuler has introduced a line of energy-efficient presses. The company has also made large investments in China. In fiscal 2014, Schuler’s revenues were 1.2 billion Euros while operating income surpassed 100 million Euros for the first time. Because Schuler’s products represent major capital expenditures for its customers, Schuler’s results tend to be cyclical. Still, the company’s revenues have grown by a healthy 7.8% over the past decade. Over the course of the decade, Schuler’s operating margins show a general uptrend. A cyclical company’s operating margins should never be examined in a vacuum; one year’s results say little about normalized margins. But I think it’s safe to say that Schuler has a enjoyed a sustainable increase in operating margins in tandem with its top-line growth. The three year period from 2012 to 2014 produced real Eurozone GDP growth of a cumulative 2.3%. During this period, Schuler’s operating margins averaged 8.3%. The years 2004 through 2006 produced real Eurozone GDP growth of 8.1%, but operating margins for that period averaged a miserable 1.3%. I think it’s safe to assume modern Schuler is not the same company it was a decade ago and future operating margins will look more like those of recent years. In addition to its operating improvements in recent years, Schuler has undergone a balance sheet transformation. At the end of 2009, Schuler had Eur 51.9 million in cash against Eur 298.1 million in debt and pension liabilities for net debt and pension liabilities of Eur 246.2 million. A mere five years, later, Schuler has piled up a cash balance of Eur 482.5 million. Debt and pension liabilities have fallen to Eur 211.0 million for a net cash balance of Eur 271.5 million. This remarkable change was almost entirely the result of free cash flow generation. 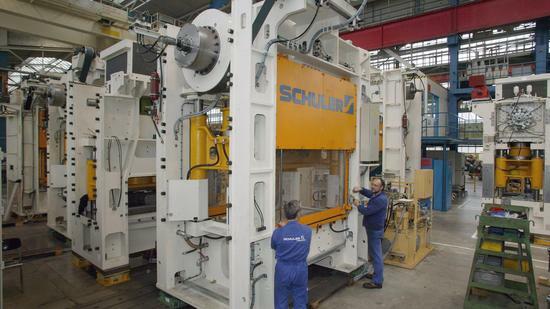 From 2010 to present, Schuler raked in Eur 459 million in free cash flow. Let’s imagine you’re a financial buyer, say a private equity firm. What would you pay to buy Schuler? Using any of the various reasonable approaches to valuation, you could come up with a wide range of fair values. But I guarantee any reasonable bidder would pay quite a bit more for Schuler than its current trading price suggests. Schuler’s market capitalization is Eur 877.9 million. Subtracting the net cash results in an enterprise value of Eur 606.4 million. Schuler shares are being valued at just 5.9x trailing EBIT and 4.9x trailing EBITDA. Shares go for 13.2x trailing earnings, while net cash represents over 30% of Schuler’s market capitalization. So why does such a successful company trade so cheaply? Schuler has great cash flow and is substantially over-capitalized. The product line is advanced and demand for industrial presses should only grow as the world economy expands. One reason: ownership structure. Over 95% of Schuler shares are in the hands of Andritz AG, a large Austrian industrial holding company. Andritz had been buying up Schuler shares for years, including those owned by Schuler’s founding Schuler-Voith family. Andritrz brought its ownership to over 95% in early 95% following a buyout offer in early 2013. Following Andritz’s purchase, Schuler shares delisted from the major German exchanges but remain listed in Munich. Trading volume has declined, but over 1,000 Schuler shares still trade hands daily. Because less than Eur 45 million worth of Schuler shares are in public hands, the company is completely uninvestable for mid-sized or larger institutions. But smaller investors can easily build up a meaningful position if they view Schuler’s value proposition as attractive. There is a catch, and it’s the chief risk of owning shares in a company that is dominated by a single shareholder. It’s the possibility of a forced merger by the controlling shareholder at an unfair price. I am not a lawyer, and my interpretation of German securities law should be viewed as only a layman’s opinion. But it appears that a company that owns over 95% of another is able to execute a mandatory squeeze-out, purchasing the remaining shares outstanding for cash. The acquiring company sets the buyout price, which is reviewed and approved by independent external auditors. The minimum price is the 3-month average trading price of the target company’s shares. Schuler’s 3-month average trading price is just 2% below the current price, so shareholders are not currently at risk of a takeunder. I also must assume (and not having any sense of the German legal system, this is only an assumption) that the external auditors in charge of evaluating any takeover by Andritz would not look kindly on a buyout price below the current trading price. And it’s not like paying remaining shareholders a price above the current trading price would be burdensome for Andritz. For example, a 40% premium to the current price would cost only an extra Eur 17 million, a rounding error for a firm of Andritz’s size. Nonetheless, Schuler shareholders could lose their shares to squeeze-out done at well below fair value. Investors should weigh this risk against the potential gains from investing in a company of Schuler’s quality at a rock bottom valuation. Alluvial Capital Management, LLC does not hold shares of Schuler AG for client accounts. Alluvial may buy or sell shares of Schuler AG at any time. In the US there is a strategy called appraisal value trading where hedge funds buy shares of buyouts or potential buyouts and go through the court system to argue a buyout is worth more per share than what the offer is for. It may be similar for german law. Thank you for this idea. As far as I understand the legal German situation, the minority shareholders are in a weak position. A bear market may result in a disadvantageous squeeze-out. Also the majority owner may delist the company at any time. I would not expect Andritz AG to pay one cent more than they are forced by the law. Andritz AG is not in the business to enrich minority shareholders. http://valueandopportunity.com/ wrote about the risks of minority shareholders; you may look or ask there for more information. That is certainly a risk, and it’s one reason I would never pay a market multiple for shares like those of Schuler AG. As pointed out in the comment above, the risk doesn’t seem to lie in a buy-out, but rather in the company going dark. German law allows for relatively easy delisting if you have a significant majority. I had that experience with the software company Magix, which was also undervalued. On the announcement, the shares dropped 30-50% (can’t remember), and stayed around that level until the time of delisting despite being super cheap. As a minority you then have the choice between owning a cheap stake in a privately owned company with no liquidity or visibility, or selling before the deadline. I assume this would be the preferred route for the holding company and is the main reason for the discount. If you want to dig deeper may I suggest to look up the German “Spruchverfahren” and Elliott vs Kabel Deutschland as an example. @Charles: You can still trade delisted shares off the exchange. But this is costly and has huge spreads and low liquidity. For a delisting the procedure depends on the stock exchange. I just discovered the German OTC market the other day and I’m trying to learn all that I can. Thanks for the writeup. This is certainly an interesting company. One question that might be asked is why Andritz has not yet forced out the minority holders. I don’t have a good explanation. Nevertheless, your call for caution is well taken.